a name I have given the other acre attached to the two lovely acres that 1922 Starkey House Bed & Breakfast sits upon, I think about what types of fruits, vegetables, or flowering bushes I could plant there. I will be looking to find multi-purpose plants great for picking, cooking, fragrance, beauty, and for sharing with my guests. Blueberries have come to mind recently, because I have been thinking a lot about how rich the Finger Lakes region is with its Native American history. The Blueberry is one of the few fruits native to North America and grows well along Seneca Lake. I have been thinking about the Native Americans from the Seneca tribe and the Iroquois that I will talk about in future writings. I can imagine what it would have been like for these indigenous people who lived off of the lands of this beautiful God Blessed area. They would walk through the woods hunting and gathering...and Blueberries would be one of the "Fruits of the Earth" they would find. Blueberries are small clusters of delicious fruit grown on a shrub that belong to the heath family, which includes the cranberry and bilberry as well as the azalea, mountain laurel and rhododendron. You can find all of these growing wild in the woods of upstate New York. The berries range in size from pea-sized to about 1/2 inch in diameter. Their dark skin ranges from a light blue to almost maroon in color. 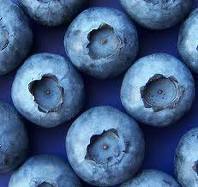 Blueberries have been found to be one of nature's healthiest fruits in all regards. They are deliciously sweet when added to muffins, pancakes, crepes, and the like, made into jams and jellies, or just wonderful on their own, just as a healthy snack. There are many farms here in the Finger Lakes region where you can go to pick Blueberries. They can easily be frozen or preserved in quantities after picking for future use during the winter seasons. This series of posts will cover just about all you might want to know about Blueberries. I will say that I am not an expert yet but love using them in my pancakes and crepes, asked for as a favorite breakfast delight many times by my brothers Ray and Bill. I will be happy to share what I find with you and I will include some awesome recipes for crepes, muffins, breads, and pancakes. Spring and Summer are on the way!